We're proud to provide Migration services. Introducing the desired platform stability and flexibility. Leveraging a small multidisciplinary production team and agile methodologies, LCM migrated SUNY Potsdam from their self-hosted legacy CommonSpot CMS to Drupal 7 on Acquia in just 8 weeks. The small team at the SUNY Potsdam Office of Public Affairs had been managing the proprietary CommonSpot CMS since its implementation in 2008. It was inflexible and the team struggled with reliability issues, so SUNY Potsdam was looking for a more useable, stable, efficient, and scalable solution. They chose Drupal 7, Acquia, and Last Call Media. 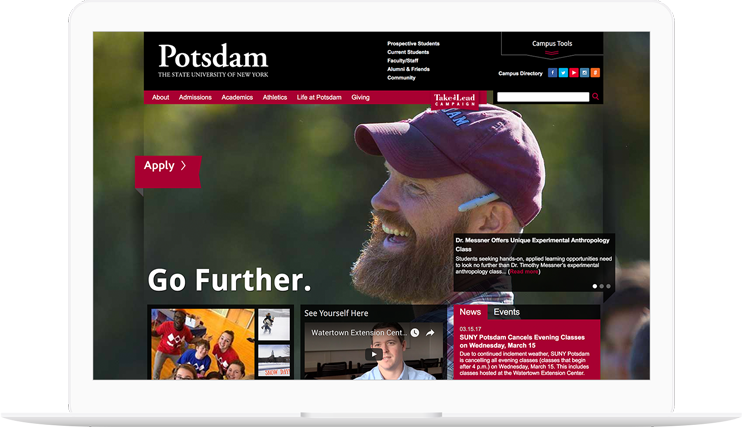 SUNY Potsdam partnered with Last Call Media and Acquia to migrate their site to Drupal 7. Leveraging the scrum methodology, LCM broke down and organized the major site features into a prioritized backlog, groomed for two-week iterations. While planning and backlog refinement was ongoing several times a week, the core development team at LCM met with Potsdam every other Friday to review work completed, provide training on the new CMS, and to facilitate the feedback-gathering process. 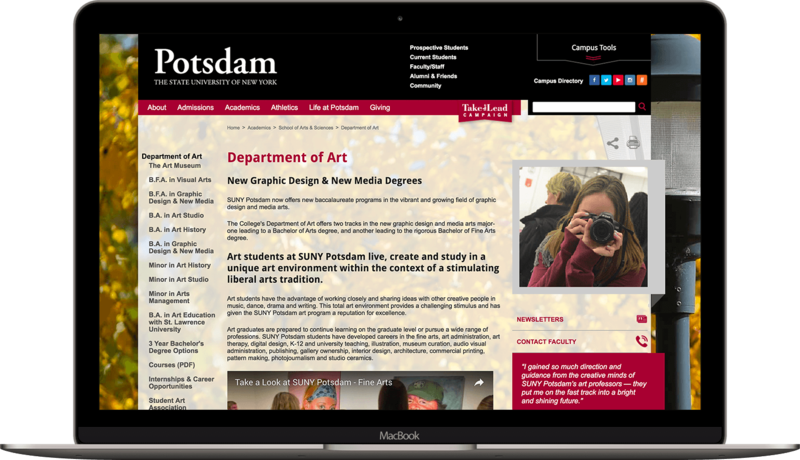 Since SUNY Potsdam had recently gone through a redesign, the project required the new site to maintain the existing look and feel. We began with an in-depth audit of all the different page types and page elements. Instead of doing this manually page by page, we first looked for a programmatic solution. Since CommonSpot did not provide a way to generate this information within the CMS, LCM used its HTML Crawler tool to programmatically crawl the existing production site and analyze the various HTML tags to determine page elements (such as slideshows, feeds, etc), including where and how often they appear. This provided tremendous visibility into the site’s underlying structure, which was critical in planning our approach to the migration to Drupal. 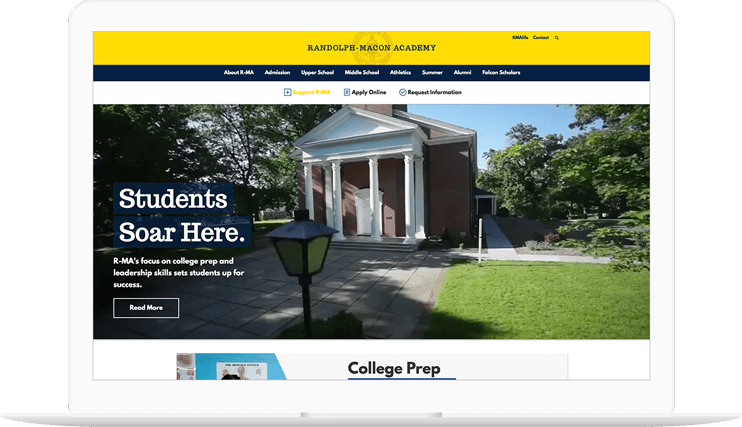 After reviewing this data with SUNY Potsdam, we began the process of consolidation– instead of building one-off page elements, we consolidated similar elements into single widgets that behaved differently based on where on the page it was placed. This helped reduce the vast number of options a content author has to choose from, making it easier for them to do what they need to do: focus on the content. 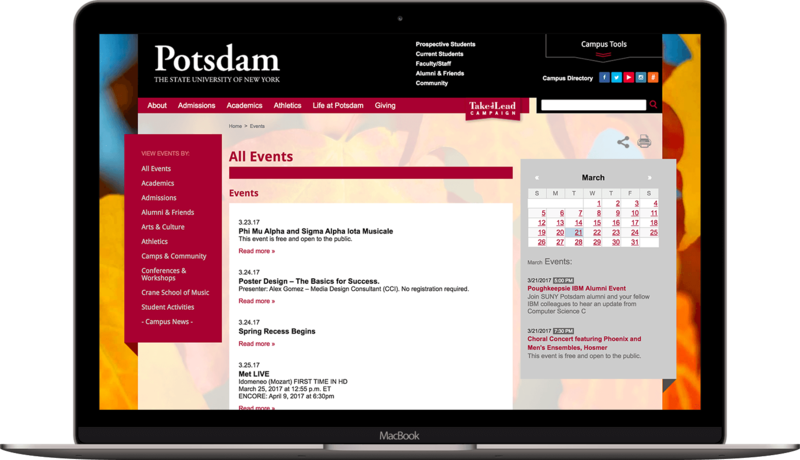 To achieve the desired platform flexibility, LCM built a repository of flexible and adaptable widgets to allow the marketing team at Potsdam to build custom pages. The migration included several different page templates and tens of thousands of pieces of content, which required writing and testing a series of migration scripts to get all the content from one CMS to another without downtime or a lengthy content freeze. Since the CommonSpot installation did not have a concept of structured content, LCM used it’s HTML crawler tool again to programmatically identify page content and then map it to its new location in Drupal. Once the custom scripts were written and tested, the migration took only 15 minutes for tens of thousands of pieces of unique content and the associated metadata, such as date published, authoring information, and URL. 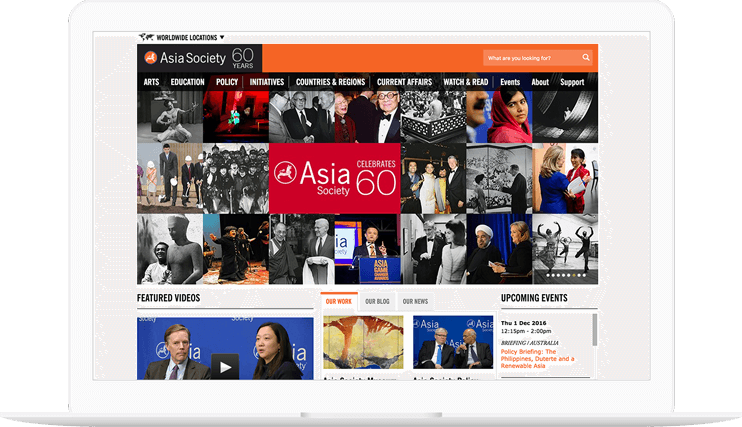 The new site also pulls in events automatically from their event management system, SOGo, and tags the event to the relevant department or office in the CMS so that it appears on that organization’s page. Lastly, in order to make it as easy as possible for content authors to login to the site, we leveraged the identity management service at Potsdam, Active Directory, to allow users to use their domain credentials to authenticate with Drupal. 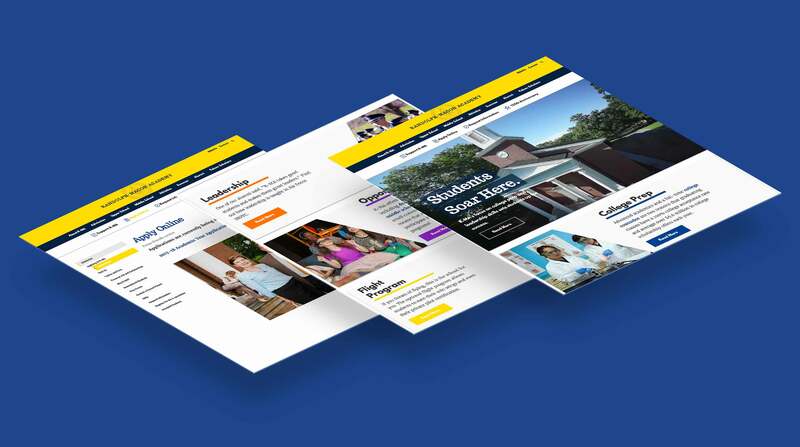 This project addressed several internal pain points with the SUNY Potsdam main website, allowing the marketing team to move from maintenance and support tasks to other organizational priorities. The site loads blazingly fast on Acquia, and Potsdam continues to work with LCM in an ongoing support relationship. 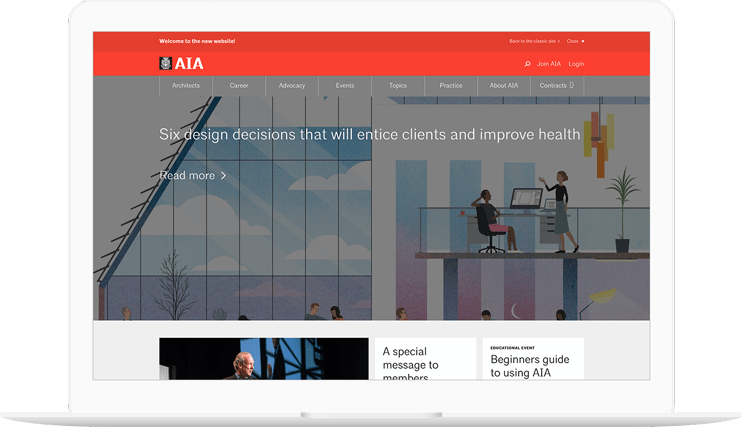 AIA Top Ten digital transformation. Bringing an age-old contest from paper to a web app. The American Institute of Architects had a legacy web application that displayed contest winners from past AIA Top Ten contests. The entries were complex static HTML pages consisting of more than 10 years worth of winning projects. Each project was explained and judged on around 100 different criteria. Every year, architects would submit their entries via a paper form, which would then be copied and distributed to the judges. At the end of voting, winning entries would be converted into webpages for display on the site. This process required an extremely high level of involvement from applicants, administrators, and judges. We built a custom form submission system, spanning 13 pages of information, that allowed users to save, resume, and rollback their nominations. An administrative workflow was added for approval, voting, and judging, plus a PDF exportable version for offline viewing. Winning submissions can be flagged as ‘winner’ which publishes the data to the public website. Non-winning submissions are set back to pending and can be resubmitted annually for up to 10 years. The result of our work is a streamlined version of the former project submission process. It requires far less work to maintain, and because it was built on a Content Management System, future changes or upgrades to the site are far easier than they would have been with the old bespoke system. Compelling design focused on furthering the school’s mission. 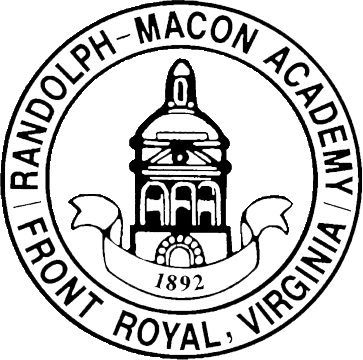 Randolph-Macon Academy desired a responsive digital experience that incorporated a consistent, compelling design focused on furthering the school’s mission, and that could easily be modified by appropriate staff with the proper permissions. We were able to deliver modern visual stylings and multimedia capabilities that loaded quickly and performed optimally, while incorporating best practices for analytics, social media integration, and search engine optimization. In addition to informing prospective students and their families about the school, the site met the needs of other important stakeholders such as current parents, current students, alumni, faculty, and staff— each of whom had their own needs from the site. The site also housed faculty and staff human resource forms and information, serving as an intranet behind the scenes. 15,000 unique publications in under 15 minutes every night. Yale University Press has a massive collection of over 15,000 unique publications they’ve published over the past 100 years. 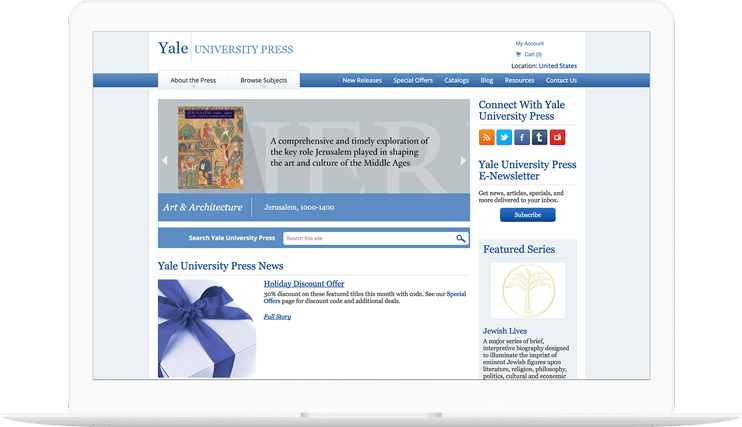 The Press desired the ability to allow their users to browse, check inventory and purchase items directly from their Yale University Press Drupal site, which required relaunching their site on Drupal 7, integrating their collection management system and an e-commerce and fulfillment solution. After working with another vendor for over three years to get the critical nightly sync from their Microsoft SQL Server Management Studio database to Drupal sync running, Yale University Press was seeking a second opinion. Working with Yale ITS and the Press, we successfully implemented a nightly sync that queries their SQL Server for changes made in the last 24-hrs and updates the records in Drupal in under 15 minutes every night at midnight. The new DocuWare.com on Drupal. Replatforming a giant in document management. 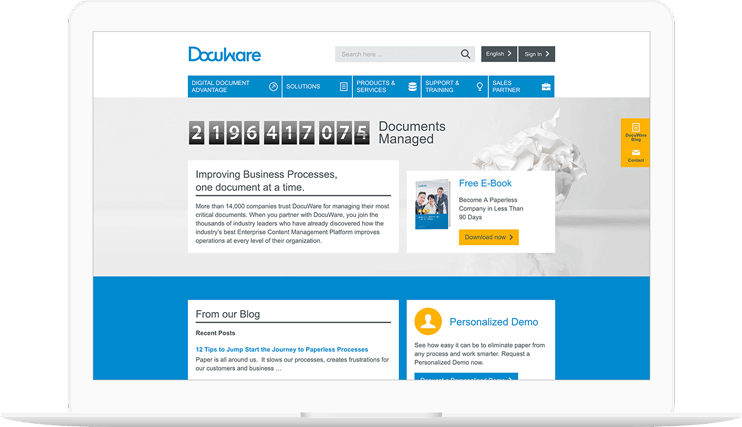 Originally built with many cumbersome integrations on an outdated proprietary .ASP CMS platform, DocuWare.com could no longer serve the company’s current and future needs. As the project lead, LCM collaborated with DocuWare’s team spread across four different global locations. With the Drupal panels module, a custom content creation workflow that imported content from multiple distinct systems and built a fully-functional online community was developed. LCM’s integrations with all vital external systems (CRM, document management, and software licensing), as well as the data tunnels established between the website and critical internal systems at DocuWare, allow tens of thousands of customers to share ideas and resources across DocuWare’s regional networks for the first time in the history of the company. The result is a seamless customer experience across all divisions, deployed in under six months. DocuWare, in the midst of a rebranding effort and needing to refresh its online presence, contacted Last Call Media to update its content management system. Its massive website, with multiple integrations to external servers and an outdated proprietary .ASP CMS, could no longer serve the company’s needs and was not flexible enough for DocuWare’s expected growth trajectory. Last Call worked in cooperation with DocuWare’s web services teams in the US and Germany to manage collaboration efforts between four firms in different global locations. 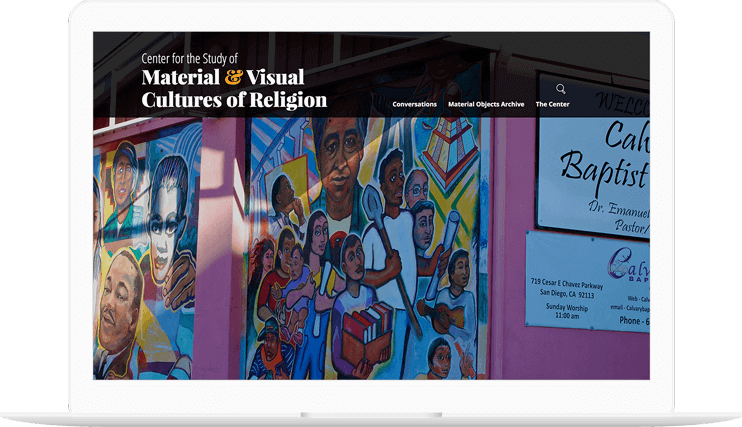 This project allowed Last Call Media to take the Drupal panels module to new limits—develop a custom content creation workflow, import content from multiple distinct systems, and build a fully-functional online community. Each firm contributed individual elements of the design, content strategy, and brand development, making this a truly exciting collaborative process. Last Call’s maintenance of integration with all vital external systems (customer relations management, document management, and software licensing), as well as the data tunnels established between the website and critical internal systems at DocuWare allowed tens of thousands of customers to share ideas and resources across DocuWare’s regional networks for the first time in the history of the company. The result is a seamless customer experience across all divisions, deployed in under six months. High value collaborative conversions needed. Rapid migration and training for six departments. The Dean of UMass Social & Behavioral Sciences (SBS) school had provided a grant to its departments to migrate and update their out-dated static websites to Drupal. Each department had its own web team, so the engagement was more about collaboration, with LCM doing much of the heavy lifting, while also facilitating and coaching an agile process. 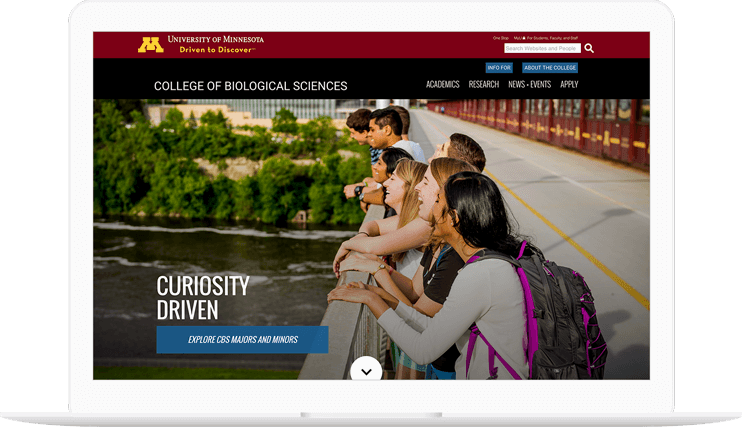 We recommended a rapid, iterative, agile approach to migrate each static HTML site into database-driven websites using the University’s identity management system, Shibboleth. To achieve the highest value within the budget, each department, working with a Last Call producer, could decide how to prioritize tasks for migration, training, and new feature development. To accomplish the overall project, LCM divided the total grant and project scope into a series of one-week sprints, two sprints per department. We met with each department to develop and prioritize the initial backlog of desired tasks for each department site. Each sprint started with a sprint planning meeting, which included department web teams as collaborators. Some departments were able to prioritize training, enabling them to do more manual migration of content, which in turn freed up sprint time for LCM to do more new feature development. 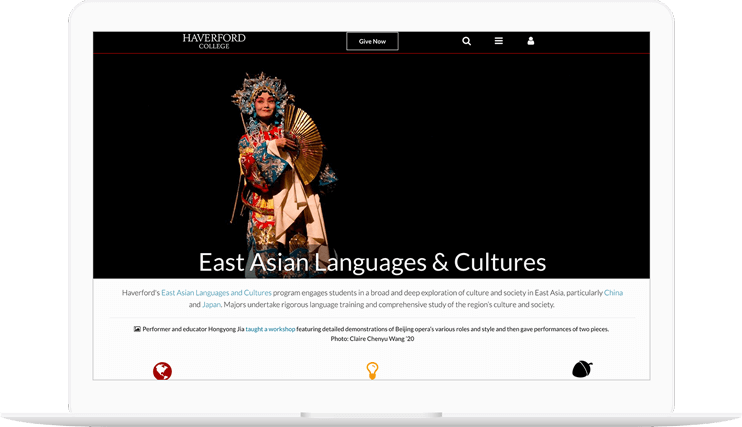 Leveraging the UMass University Relations custom theme, we rapidly developed numerous websites and provided training and support for each department to develop and deploy their own websites. The process was very fast and highly collaborative. Due to the agile approach, several departments got additional features beyond the migration of their content from their static websites.